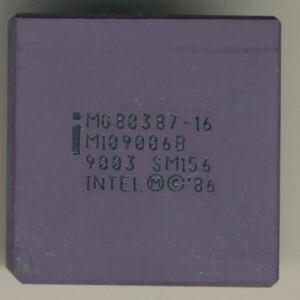 The year is 1981, Intel is making the 8/16-bit 8086/8088, and Motorola has released the 16/32-bit 68000 processor to much fanfare. Motorola marketed this as the first 32-bit processor, but while it supports 32-bit instructions/data it does so with a 16-bit ALU. HP, always used the MC68000 in their 9000 Series 200 line of computers, providing rather good performance for 1981. But this was the 1980’s and HP wasn’t satisfied with good, they wanted more, they wanted to implement a full 32-bit computer on something less then the 5,000 IC’s typically used to implement one at that time. 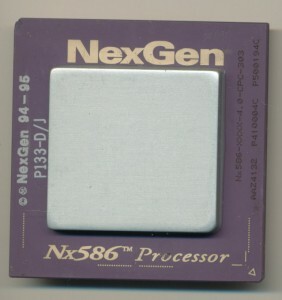 This meant making a processor like nothing else before, something with more then the 68,000 transistors of the MC68000 or even the 134,000 transistors of the new i286 Intel had announced. What HP made is simply remarkable, in 1981 they announced the HP 9000 Series 500 computers, powered by an all new fully 32-bit processor called the FOCUS. 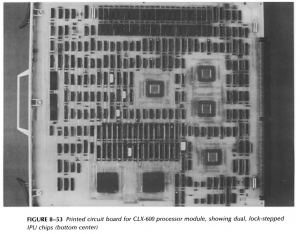 FOCUS was made on HP’s high density NMOS-III process, a 1.5u process, and used 450,000 transistors. 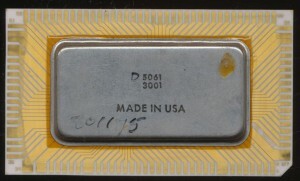 Thats 450,000 transistors on a single 40.8mm2 piece of 1.5u silicon in 1981, a smaller die than the Intel 286. 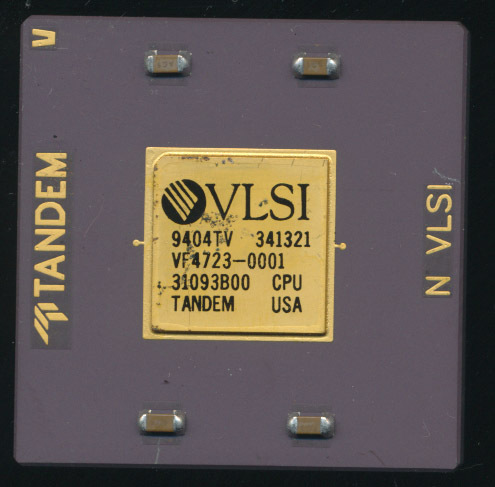 TANDEM CLX 800 Processor – VLSI CMOS 1u process – 16MHz. 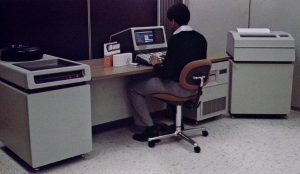 Tandem Computers was established way back in 1974, and was one of the first (if not the first) dedicated fault-tolerant computing companies. They designed completely custom computers designed for use in high reliability transaction processing environments. These were used for support of stock exchanges, banks, ATM networks, telephone/communications interchanges, and other areas where a computer failure would result in significant, costly, disruptions to business services. Tandem was started by James Treybig, formally of HP, and a team he lured away from HP’s 3000 computer line. processors,all were redundant, but unlike some other systems, components were not kept as ‘hot spares’ sitting idle until something failed. This kept hardware from being ‘wasted.’ Under normal operation if it was in the system, it was contributing to system performance. A failed component then would reduce system performance until it was replaced/fixed, but a customer would not be paying for hardware that served them no purpose unless something broke. To support these goals Tandem designed their own processors and instruction set architecture know as TNS (Tandem NonStop). The first processors were a 16-bit design call the T/16 (later branded NonStop I) made out of TTL and SRAM chips spanning 2 PCBs. Performance was around 0.7MIPS in 1976. They were a stack based design similar to the HP3000 with added registers as well. T/16 systems supported 2-16 processors. NonStop II, released in 1981, was similar, but supported the occasional 32-bit addressing, increasing accessible memory form 1 to 2MB per CPU and performance to 0.8MIPS. 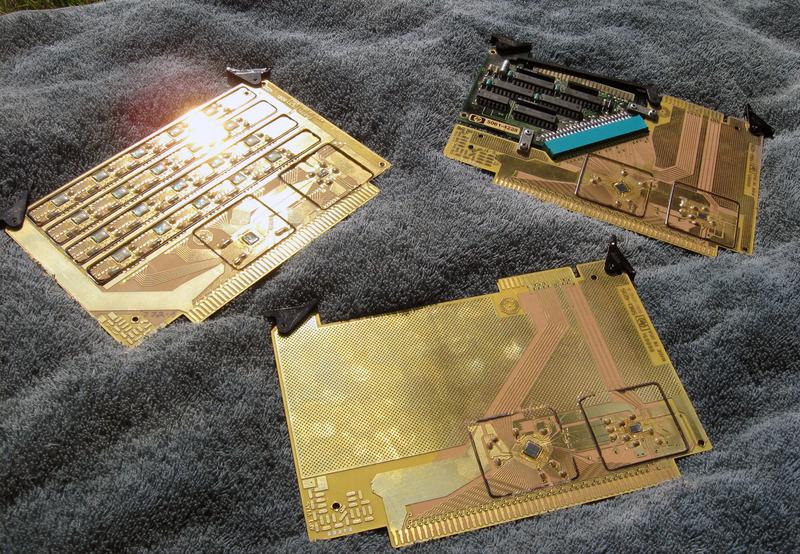 The Lighting processors of the HP A600 and A600+ were good performing for 1982. They filled the entry and mid range slots of the HP 1000 A Series quite well. 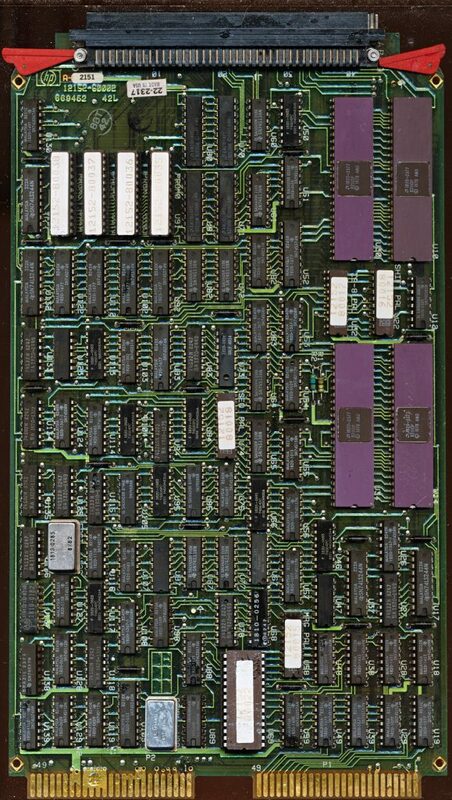 The additional floating point support of the A600+ in 1984 helped considerably as well, but what was needed for truly better performance on the high end was hardware math support. While the HP A600 took only 9 months to design and release, the A700, released at the same time, took somewhat longer. 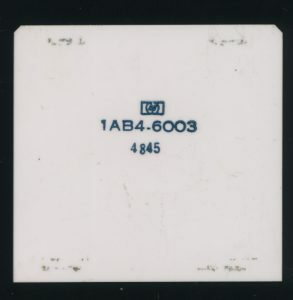 The A600 was based on the AMD 2901, which had been released way back in 1975. The A700 Phoenix was based on its successor, the AM2903. The 2903 added a few important features to the bit-slicer. Hardware multiply and divide support,support for more registers, and easier ways to access them, and parity generation. This is why the A700 took longer to design, the A600 design was begun half way through the A700 to fill the lower end, where the features of the 2903 wouldn’t be as missed. 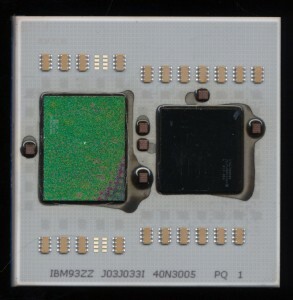 The A700 performs at the same 1 MIPS as the A600 but supports 205 standard instructions (compared to 182 for the A600 and 239 for the A600+). It adds more register reference instructions, dynamic mapping, I/O and more math based instructions. Cycle time is actually slightly slower, 250ns compared to 227ns for the A600 but the 2903 allows more efficiency making up for the difference. 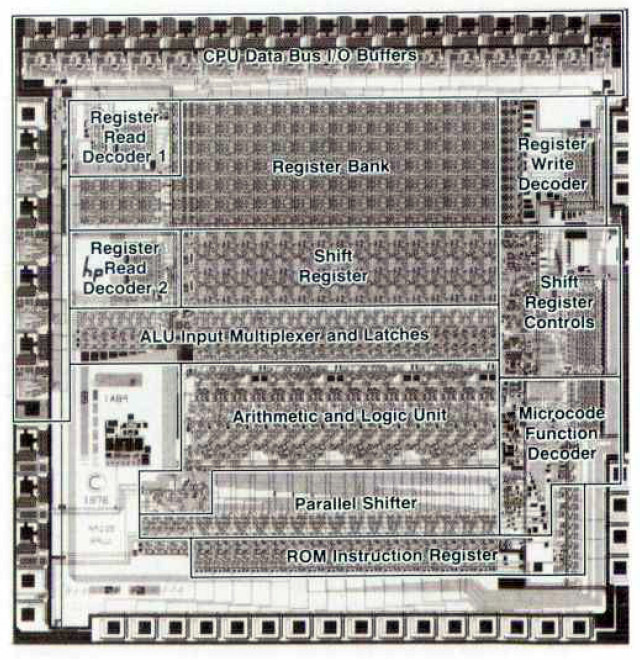 A typical FMP instruction take 13.75-25.25 microseconds compared to 16.6-26.6 on the 2901 powered A600. This is a direct result of the hardware multiply hardware included in the 2903. The A600+, with its faster 2901C’s completes the same instruction in 17-21.1 microseconds, FASTER then the A700. But the A700 has a trick up its sleeve…. In last months article on HP’s 16 bit processors we mentioned it was made in a reduced version (on an enhanced NMOS III process). 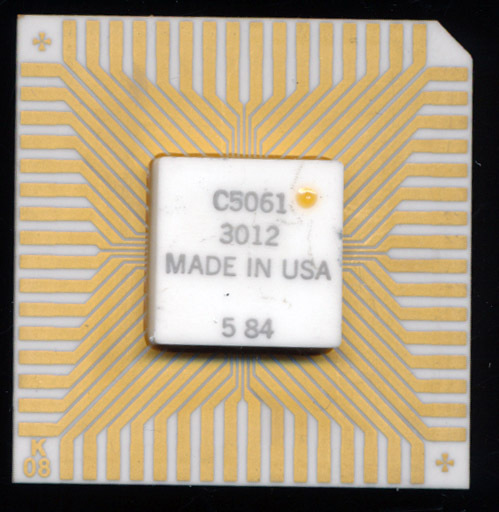 This CPU was known as the C5061-3012. 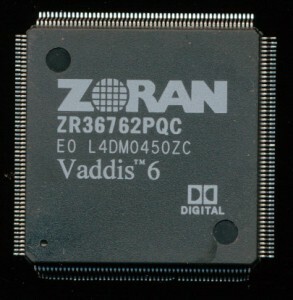 It contains only a BPC (Binary Processor Chip) and no EMC or IOC. It was meant for simpler designs, such as a tape controller, but also in some other HP test equipment. While a simpler implementation, it would seem that HP chose to continue the use of rather beautiful, and highly delicate packaging. This example was made in 1984, a time when most other ICs were grey ceramic or plastic, not a white/gold ceramic package. 40+ Years after computer processors began to be made, there are several that stick in peoples minds as ‘the greats’ as being somehow more important then others. Processors such as the Intel 4004, the MOS 6502 of Apple fame, and the Motorola 6800 have taken histories podium as the most important. The DEC Alpha was one of the fastest processors of the 1990’s. 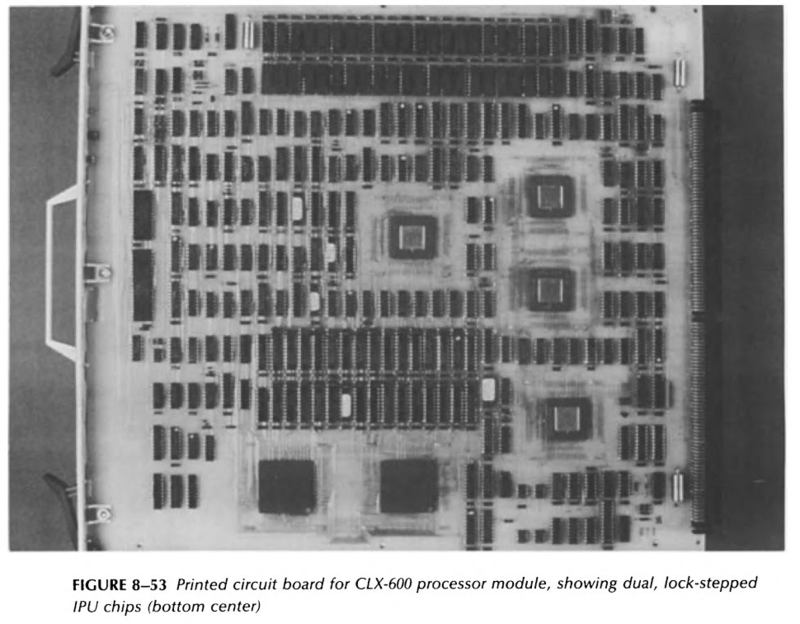 The original 21064, manufactured in CMOS, rivaled the fastest ECL processors and blew away most everything else. Clock speeds were 150-200MHz (eventually hitting 275MHz) at a time when a standard Intel PC was hitting 66MHz, at the very top end. 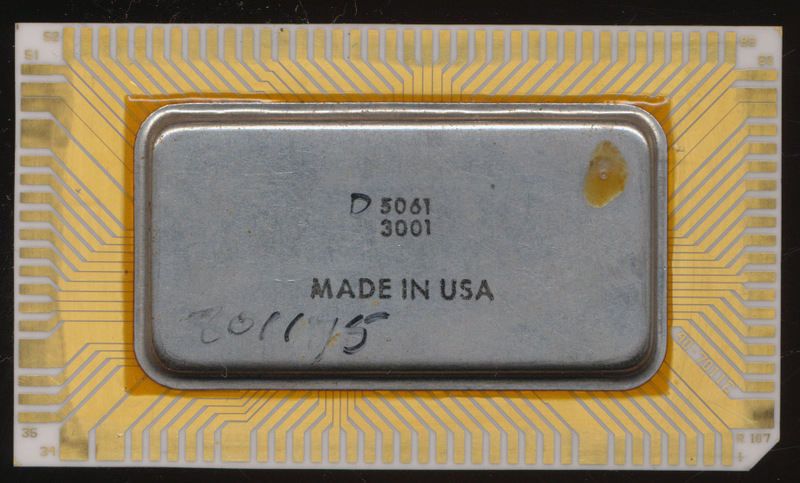 It was manufactured on a 0.75u process using 1.68 million transistors. 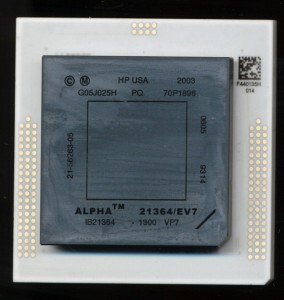 The Alpha was a 64-bit RISC design, at a time when 16-bit computing was still rather common. This gave the architecture a good chance at success and a long life. 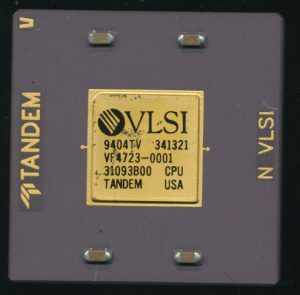 The 21064 was followed by the 21164 in 1995 with speeds up to 333MHz on a 0.5u process, now using 9.3million transistors. It added an on die secondary cache (called the Scache) of 96KB as well as 8KB instruction and Data caches. 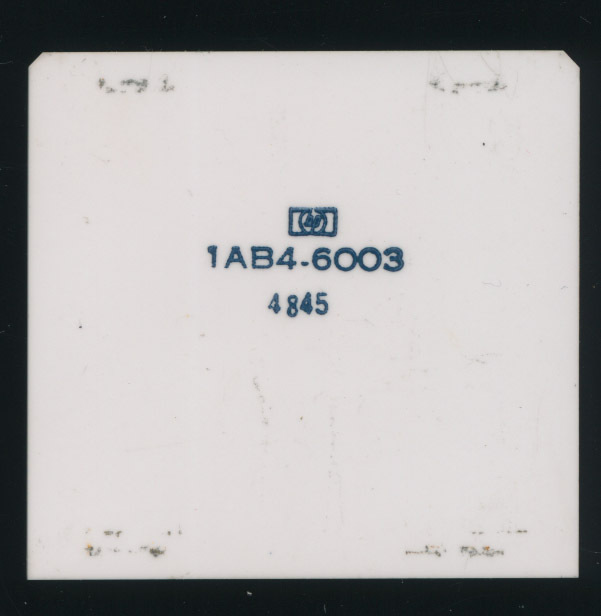 These accounted for 7.2 million transistors; the processor core itself was only around 2.1 million, a small increase over the 21064. At the time the main competition was the Pentium Pro, the HP PA8800 and the MIPS R10000. Improved versions were made by both DEC and Samsung, increasing clock speeds to 666MHz by 1998. In 1996 DEC released the next in the series, the 21264. 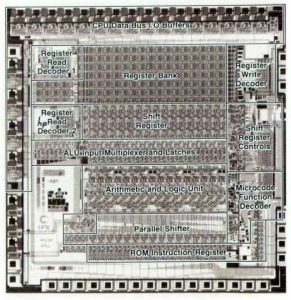 The 21264 dropped the secondary cache from the die, and implemented it off chip (now called a Bcache). The level 1 caches were increased to 64KB each for instruction and data resulting in a transistor count rise to 15.2 million, 9.2 million of which were for the cache, and the branch prediction tables. Frequency eventually reached 1.33GHz on models fab’d by IBM. However the end of the Alpha had already begun. DEC was purchased by Compaq in 1998, in the midst of the development of the enhanced 21264A. 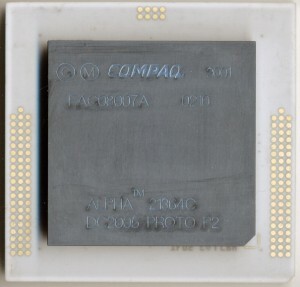 Compaq was an Intel customer, and Intel was developing something special to compete with the Alpha.